First things first. I recently mentioned how much I enjoy doing searches, finding Ninas and so on... well, today, I got to put it to good use at work. We're starting this new advertising campaign that is centered around the state of Tennessee, the people we serve, and so on. The common thread is people saying, "I'm here" in a lot of different contexts - a father teaching a kid to ride her bike, a couple hiking, a friend meeting a friend at yoga class, a physical therapist and patient, a bride and her father. They're great ads. You get to see some pretty things around the state, and they have a really diverse set of ages, races, etc. It's a great series of ads. Anyway, in conjunction with that, we have a contest going where we are supposed to watch the ads, and list out the 19 things that relate to the state of Tennessee - symbols, logos, locations and so forth. So, I found about ten of them easily. Then I had to take each of the ads, frame by frame, like the damn Zapruder films trying to find the remaining ones. I think that I managed to do it, though there's one or two that may be up for debate. We'll see. I could win some goods and services that are referenced in the ads. Tickets to sporting events, museums, a gift card for ice cream... the usual. I might have spent an hour looking. It was fun, though - and now I'm thoroughly familiar with the campaign. Coming soon to a TV near you, assuming you, like me, live in the state of Tennessee. Now. Time to talk about something more vapid. Beauty products. I'm going to start with Rodan and Fields. You may know someone selling these. I know quite a few. I've had three people approach me to either buy them or sell them. I think it's awesome that they're doing something they like and selling a product they believe in. They've been super successful with it, and I am pleased for them. That said, it's not for me. I don't want to get into sales. No way, no how. As for buying the products, they're fairly expensive, and honestly, I have a skin care regimen that works for me. Neglect. Lots and lots of neglect. I wash my face in the shower, I splash some water on it at night... I put lotion on it when it needs it, and I rarely wear makeup. And nothing more than face powder, a little eye makeup and some lips. So, you know, I'm crazy low-maintenance. But that's fine. It's who I am. Now, that said, from time to time, I like to skindulge (see what I did there?). I'll buy a cheap mask to do a DIY Spa Night. Back in the day, the best you could get was a clay mask with toning or moisturizing properties. Now, it's all about sheet masks. Some that look like pandas or tigers or whatever. This was an otter. It was otterly creepy. Some are infused with pomegranate, or rose essence or aloe. They're really nice. They're part of a new "thing" - J Beauty and K Beauty (J for Japan, K for Korea). 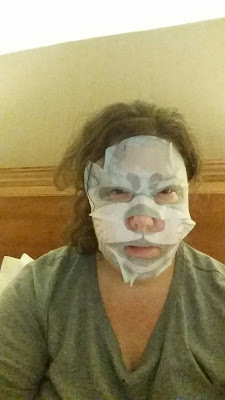 I bought a Korean firming mask that is supposed to make my skin look amazing - but it's a real chemistry project, plus, I want to document the hell out of it - before, during and after. Hell, maybe it isn't new. It is new to me, though. And yes, I know I should be taking better care of my skin. But honestly, there's only so many hours a day, and I have to devote that to finding Tennessee symbols in advertising. And petting my dog. And making tacos on Tuesdays. And on and on. That's the skinny.